Pictured with the Metro East Quad League Championship trophy are Scholar Knights (front, from left) Anna Klostermann, John Hund, Ben Logullo, Mai Khuc, Taylor Goring; (back, from left) Abby Brandenburger, Abby Kay, Taylor Foster, and Dakota Hemker. 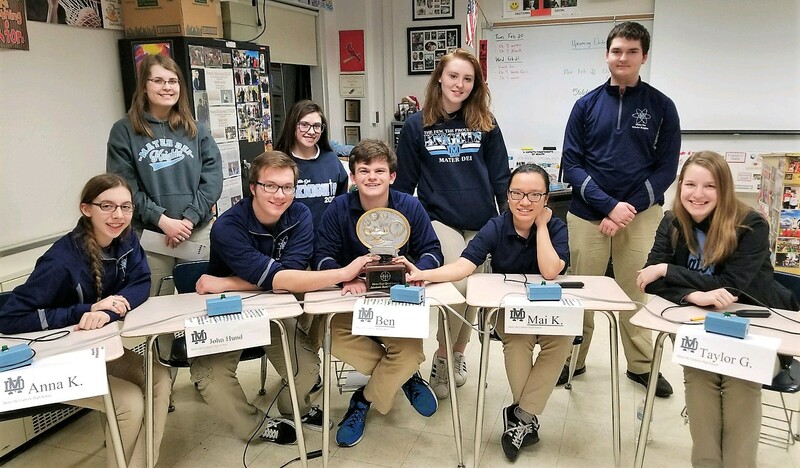 On Thursday, February 22, the Scholar Knights traveled to Granite City to defend their Metro East Quad League playoff championship. In match one, Mater Dei faced the O’Fallon Panthers, who, like the Knights, had only one loss in regular season Quad League play. The Panthers came out firing and led 120-20 after five questions. The Knights continued to battle, as they minimized the gap to 170-130 at halftime and tied the score after eleven questions. But, O’Fallon strung together another scoring run to lead 260-220 after fifteen questions. Mater Dei finally took the lead after seventeen questions, expanded the lead, and won 370-300. The Scholar Knights were then challenged by the Granite City Warriors in match two. Although the Warriors converted an outstanding nine of the first twelve toss ups, the Knights stayed close by converting a higher percentage of the bonus questions. With seven questions remaining and Granite City leading 220-160, Mater Dei converted the next five toss ups to grab a 300-220 lead. The Warriors continued to battle, keeping the match result in doubt until the last question, but the Knights prevailed 310-290. In the finale, Mater Dei had to defeat the Belleville West Maroons to assure they would take home the championship trophy. The lead see-sawed several times in the first half, but the Scholar Knights led 170-120 at halftime. The Maroons never regained the lead in the second half, as the Knights went on to win 310-240. Ben Logullo led the Scholar Knights with a total of 11 toss ups, followed by John Hund (6), Mai Khuc (5), Anna Klostermann (2), and Taylor Goring (1). Taylor Foster, Abby Brandenburger, Abby Kay, Dakota Hemker, and Ben Wilke also contributed to the victories. The wins improve the Knights’ record to 65-10 on the season (as of February 22).